This article appears in the June 14, 2010, issue of ESPN The Magazine. Get the full issue — the World Cup preview — by clicking here. The boy was handed an AK-47 assault rifle and taught how to clean, load, aim and fire it. There was target practice for a while, which was fun. Almost like a video game, only louder with more recoil. Then one day, the boy was blindfolded. Until 2002, when the war ended, there was blood all over these streets in Luanda, Angola’s capital. But on this January evening, the stream of red stands for something different. In hours, at a new soccer stadium on the city’s outskirts, Angola will play Ghana in the quarterfinal of the Africa Cup of Nations. Everyone, it seems, is dressed in red, the jersey color worn by the host country. Angolan flags are everywhere: on cars, hanging from tenement windows, taped to the concrete and sheet-metal walls of the boxes that form the favelas. For 90 minutes plus injury time, the people of Angola will stand and sing in unison, cheering for their national team, the Palancas Negras (Black Antelopes). They will get lost in the colors and the action, and will tingle inside to the chants of “An-GO-la! An-GO-la!” They will try to forget that most of their countrymen live in squalor and get by on about two dollars a day, despite Angola’s oil-fueled economy. They will try to forget that a child born here is expected to live only to age 39. They will try to forget the rage of tuberculosis and HIV, and an infant mortality rate that’s among the world’s worst. And they will hope that this game — not so much Angola vs. Ghana, but soccer itself — can be a force to ease their problems, to help them forget about the divided past and build a united future. This June, when South Africa becomes the first country from its continent to host the World Cup, the 32 teams in the field will basically play one of two styles: the possession game, based on short passing and ball control, or the direct game, built on long passes into open space. To play the direct game, a tactic that often works wonders for underdogs, you need speed, strength and desire. Fittingly, long balls are often called “hopeful” passes. This has been so since the mid-19th century, when British, French and Belgian colonists introduced the sport, from Casablanca to Cape Town. As the continent was subjugated, Africans took to the colonists’ diversion, first watching, then playing, then playing it well. As empires dissolved in the 20th century, soccer helped bind new nations — and bring justice to others. In 1957, the first Africa Cup of Nations was held in Sudan with four teams: Sudan, Egypt, Ethiopia and South Africa. But when the South Africans refused to field a multiracial team, they were disqualified. Four years later, FIFA suspended them for the same reason; in 1976, they were expelled from the organization. It wasn’t until 1992, after South Africa integrated its soccer federation, that the country was reinstated. “Football was viewed as an important part of the liberation struggle,” Jordaan says. Africa’s nations have come far since Zaire, now the Democratic Republic of the Congo, lost 9-0 to Yugoslavia in the 1974 World Cup (see page 54). The Africa Cup of Nations, which has been held every two years since Ethiopia served as host in 1968 and which is contested by 16 teams (based on qualification rounds), now features some of the globe’s biggest stars. Many consider it the world’s second-most important continental soccer competition, behind the European championship, which is played once every four years. 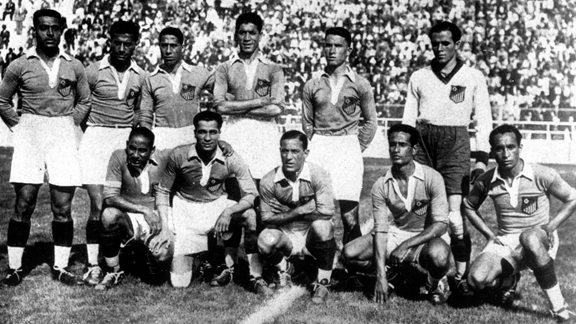 Olycom/SIPA Egypt’s 1934 team was Africa’s first World Cup qualifier. Adds Claude Le Roy, a Frenchman who’s coached the national teams of Cameroon, Senegal, Democratic Republic of the Congo and Ghana: “You can’t find anyone in Africa who says, ‘I don’t care about football.’ ” This is why footballers are the face of all causes in Africa, from HIV/AIDS awareness to the fight against hunger and malaria to the crusade for literacy and peace. Football for everything. But nothing, not even the beautiful game, is a cure-all. In the past year, we’ve seen Egyptian fans hurling rocks at the Algerian bus days before a World Cup qualification match, and machine-gun-wielding Angolan separatists firing upon the Togo team on its way to the Cup of Nations. Perhaps most disturbing of all, agents have trafficked young African players to other continents with no regard for their welfare. “There is more talent in Africa than anywhere else in the world, even Brazil,” says Patrick McCabe, a FIFA-registered agent who has represented more than 40 African players. “But the infrastructure of most African countries does not allow for the talent to be exposed, trained and exported in an efficient manner.” After playing in South Africa from 1995 to 1997, McCabe became an agent to try to help facilitate the desires of some of his teammates to play in MLS after the league debuted. He ended up bringing over players from Mozambique, South Africa, Ghana, Sierra Leone, Senegal, Gambia, Togo and Botswana, among other countries. Within a short time, he was flooded with so many inquiries from aspiring pros that he had to remove his e-mail address from the FIFA website. “You can’t help all of them,” he says. “But you also don’t want to take their dream away by telling them they won’t make it, because in some cases maybe they will. It’s a hard position to be in, trying to decide someone’s course in life.”McCabe recently arranged a trial with D.C. United for a Gambian player, who took a taxi and water ferry for eight hours before arriving in Senegal for a 3 a.m. departure. After a seven-hour flight, he arrived in Washington at 7 a.m. and was on the field by 2 p.m. He didn’t make the team, but at least his shot was legit. Far too often, McCabe says, agents peddle fake or dubious opportunities. In 2000, more than a dozen African players ended up in a Belgium shelter for human trafficking after signing contracts they didn’t understand. (Many of the deals channeled a large share of each player’s salary to his agent.) Recently, London’s Guardian uncovered that there were 500 unlicensed soccer “academies” in Accra, the capital of Ghana, outfits that in exchange for inordinate fees promised fame and fortune to boys. Promises they couldn’t keep. But it’s not just momentous for South Africa. It’s a tribute to all African stars who have elevated the game worldwide. For Ghana’s Abédi Pelé, who starred in France and Italy in the 1980s and 1990s, and Liberia’s Weah; neither man ever got to play in a World Cup. For Cameroon’s Roger Milla, who earned the African game huge respect when he scored four goals at age 38 in the 1990 World Cup, leading his country to the quarterfinal. For Papa Bouba Diop, who scored the only goal in Senegal’s upset of defending champion France in 2002. And for all the players who will represent Algeria, Cameroon, Ghana, Ivory Coast, Nigeria and South Africa, this year’s tournament is a chance to prove something to the world. Just a game. More than a game. This is Africa.Jeff Bradley is a senior writer for ESPN The Magazine.